Are there any American historical figures more endearing than Ben Franklin? Who else could pull off kite-flying in thunderstorms, pithy suggestions about pennies and early bedtimes, and “diplomacy” with the French (ladies), yet still appear affable and erudite? Even today, Franklin seems to be winking out of portraits, encouraging the viewer to tick off some Britons while wearing adorably small spectacles of ones own invention. Perhaps I’m besotted, but if I ever have the chance to host that mythical historical person dinner party, you can bet your last hundred dollar bill that Ben Franklin would be there. And he’d hopefully come sailing in for that party on the Gulf Stream (putting heaven somewhere in the UK- discuss). This isn’t just an oceanographers’ quirk: in addition to his many other accomplishments, Franklin was the first person to distill centuries of nautical wisdom into a map of the Gulf Stream. 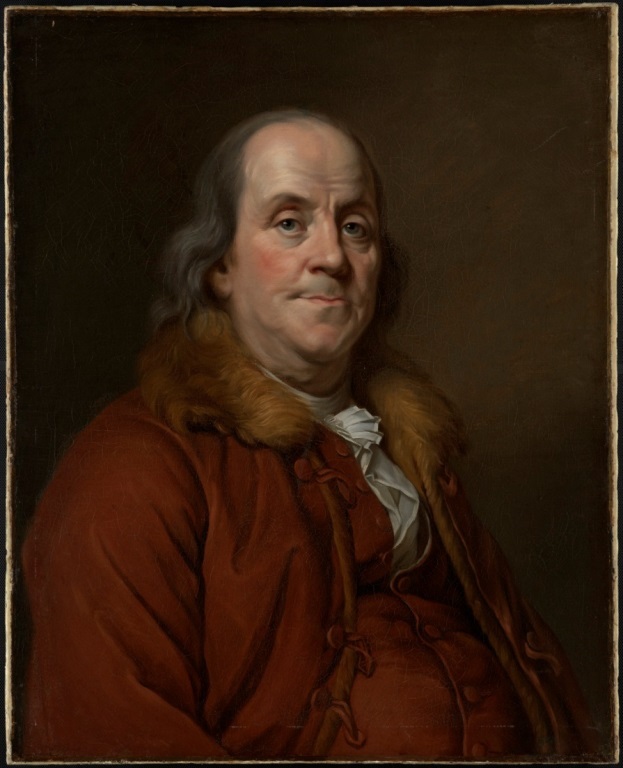 Around 1768, Franklin was serving as Deputy Postmaster General when he was consulted about a complaint that, when each set sail from England, packages destined for Rhode Island arrived two weeks earlier than ships landing in New York. Franklin was baffled; why should there be such a consistent delay in vessels traveling practically the same distance? Upon investigation, he learned that, like most other colonial heartaches, it was Britain’s fault. Ben Franklin’s cousin Timothy Folger was a Nantucket ship captain, meaning that he had decades of his own knowledge compounded with the long history of maritime operations in New England. Franklin brought the puzzle to Folger, who explained that New England whalers skirted a current called the Gulf Stream in their pursuit of whales. In doing so, they frequently encountered British ships plodding towards the colonies, sailing into the Gulf Stream. Folger said that the whalers tried to explain to the British that they were adding time onto their journey by traveling against the current, but, as Franklin quotes, “they were too wise to be counselled [sic] by simple American fishermen” (Bache 1936). This explained the apparent postal time warp. The Rhode Island packages were usually sent aboard merchant ships captained by New Englanders familiar with the Gulf Stream, whereas the delinquent ships arriving in New York were under the direction of British personnel too obstinate to avoid the current. 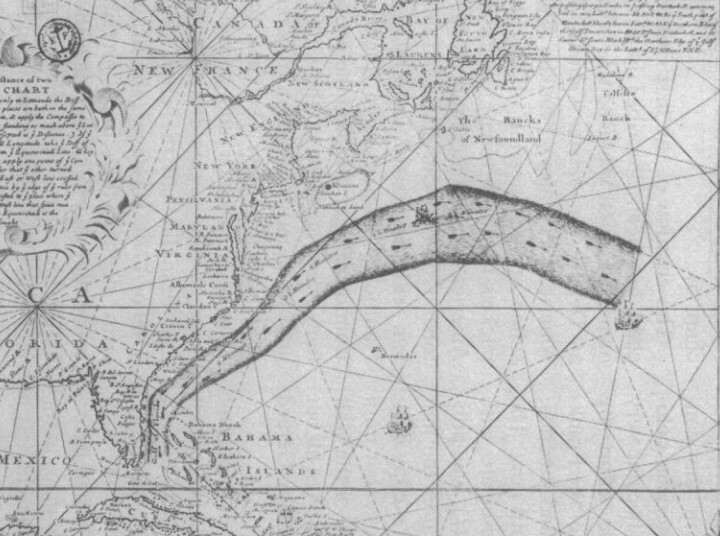 The original Franklin Folger map, zoomed in on the Gulf Stream. Image from Richardson 1980. Pragmatic as ever, Franklin requested that Folger sketch out the Gulf Stream so its path might be public knowledge. Folger complied, adding the current to an existing world map, and Franklin had “the first good chart of the Gulf Stream” printed in England and France (Richardson 1980). The map was reprinted at various points thereafter, but for centuries, the very first version of the map, printed by Mount & Page in England, was missing. Enter Philip Richardson of Woods Hole, who in the 1970s was funded in part by the NSF to spend a year in Paris, working a hunch that the map might be somewhere in France. It was suspected that Franklin suppressed the map during the Revolutionary War as a tactical advantage, but that France might have a copy thanks to Franklin’s diplomatic stints there. It makes me nostalgic for funding days I never knew, that an oceanographer could get a grant to spend a year eating croissants and embarking on a quest resembling a National Treasure plot, but Richardson delivered. He found two copies of the map in the Bibliothèque Nationale, and the map and his story were published in Science. Science?! That seems rather generous, you might think: it’s just a map. Like most of Franklin’s endeavors though, his foray into oceanography was ongoing and sophisticated. With his many transatlantic voyages, Franklin is estimated to have spent a solid two years at sea, during which he recorded observations on seawater color and temperature. After his discussion with Folger, Franklin began systematically measuring the ocean temperature at various depths along the Gulf Stream, thereby providing a practical way for sailors to identify the current as they traveled. Although knowledge of the Gulf Stream is taken for granted today, the combination of map and temperature data proved immensely useful for colonial mariners. Historian Franklin Bache suggests that the “practical value [of Franklin’s observations] was probably greater than that of his electrical experiments.” Even more impressive? Franklin and Folger’s path of the Gulf Stream is still accepted as essentially accurate, and Franklin correctly identified the reason for the current. He wrote that “[t]his Stream is probably generated by the great accumulation of water on the eastern coast of America between the tropics, by the Trade Winds which constantly blow there” (Bache). In physical oceanography lingo, the Gulf Stream is a western boundary current that results from the westerly-blowing Trades. We know that now, but Franklin said it first. Ben Franklin may not be at your next dinner party (or, sadly, mine), but if you find yourself dining with oceanographers anytime soon, well, here’s one more conversation topic! And if they hate history, you’ll only be doing yourself a favor, because although they might travel faster in the Gulf Stream, fish and visitors still do stink after three days. Ben Franklin, charming the author from 15 feet high and 200+ years in the past. Tags: Ben Franklin, colonial America, Gulf Stream, history, history of oceanography, navigation. Bookmark the permalink. Great article, Kathleen! Your funniest yet, I think. 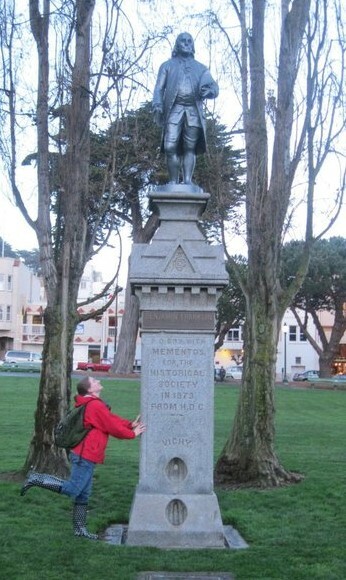 And that picture of you and the Ben Franklin statue…!! !